I have just released a new album ‘Barba Lunga’ with my Italian Trio (Jan 2019). I had a a bit of trouble uploading audio files for my new album but I’ve finally sorted it out. It features Giacomo Dominici on electric & double basses & Alessandro Pivi on drums & was recorded in Pesaro, Italy in May 2018. We’ve had a couple of reviews & quite a few radio plays. Below I’ll put links to the reviews & also to a couple of radio interviews. In the radio interviews I talk about how the album came out & includes some background information on some of the tunes. You can buy ‘Barba Lunga’ right here on my website. Just go to the Shop. 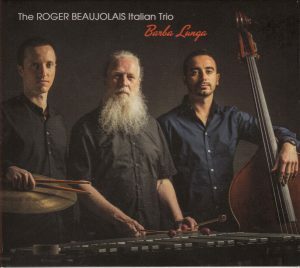 It’s also available as a digital download at bandcamp at https://rogerbeaujolaisitaliantrio.bandcamp.com/album/barba-lunga & is also available through Amazon. Club Chesterfield, Chester Street, Chesterfield S40 1DL.